Yay for free lunch! They seem to be cycling through their menu now though, because I've had this one before. 2/3 cup of fusilli pasta in herbed balsamic vinaigrette sauce, with a 4 oz braised chicken breast. 1/2 a large chocolate cookie with white chocolate chips. I really like the pasta and chicken with the balsamic vinaigrette, which is mildly sour with a smooth sweetness that balsamic vinegar is so well known for. I also like to eat the chocolate cookie along with the dish because I think the sweetness of the cookie balances out the sour and saltiness of the entree. But that could just be me hehe. Pork cutlet curry entree with fried egg. Wow, I've missed Cafe Mami's amazing Japanese food. Porter Square has a strip of small Japanese restaurants that serve up really delicious and authentic Japanese dishes, from fresh ramen to Japanese curry to sushi. Cafe Mami is the most popular restaurant at the Porter Square strip, which is nicknamed "Japantown". It also happens to be the one restaurant that has the least amount of seating available, so there is always a line and they literally cram strangers into the same tables. Today Greg and I were seated along with 5 other strangers at a table that comfortably seats 4 people. Crazy crammed, we barely had room for our plates and bowls, and it just so happens that Greg is a lefty sitting to my right, so my right elbow kept jamming into his left elbow as we were trying to eat haha. Now, back to the dinner. We started off with bowls of piping hot miso soup, which is a popular broth soup made with fermented soybean paste (miso paste), dried bonito shavings (bonito is a type of fish), seaweed, tofu, and scallions. It's a little bit of an acquired taste, as it is a rather salty soup and has a very subtle gritty texture. It tastes a little bit like soy sauce soup (I know, that sounds gross), considering that soy sauce and miso paste are both made from fermented soybeans. 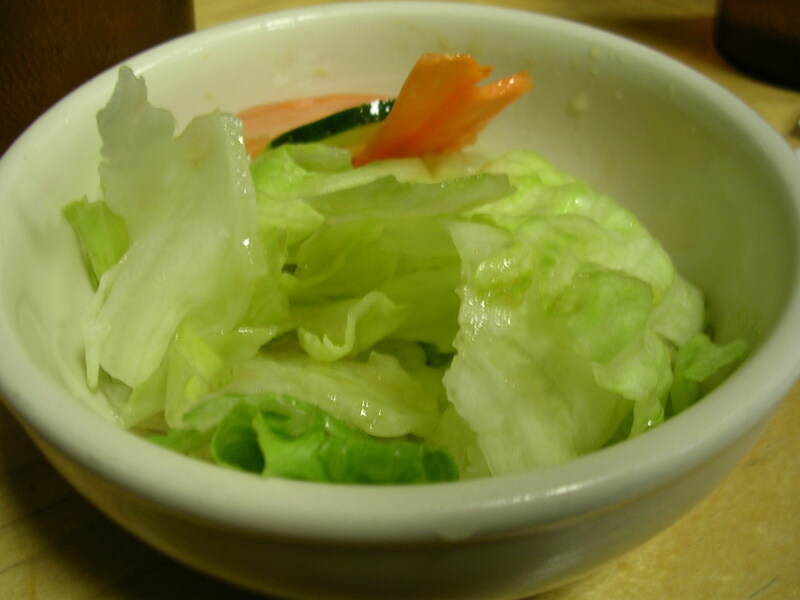 But it's really quite good, and a great starter to a meal because it is so flavorful. The only downside is that the miso paste is insoluble in water, so you have to keep stirring it before you take a sip or else it will begin separating out. 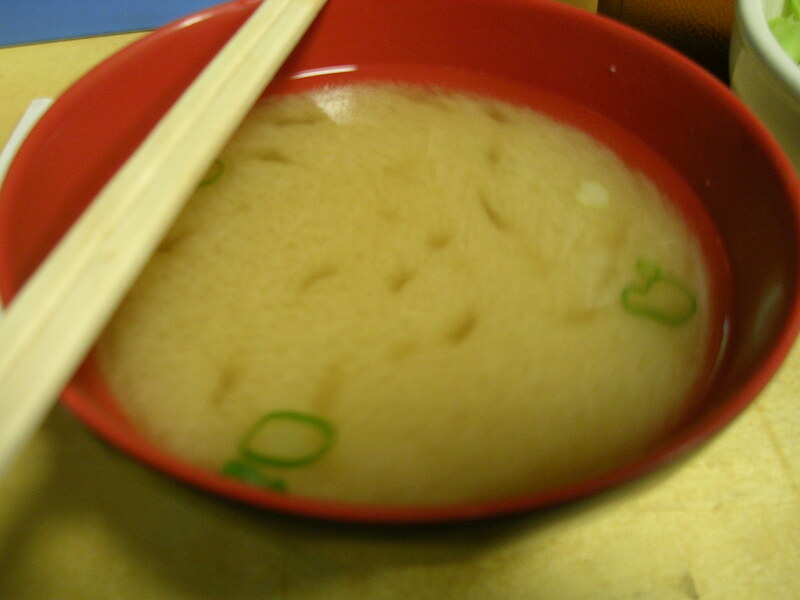 I just finished stirring it and waited for the soup to stop whirling around before I took a picture, and you can already see the clouds of miso separating from the water of the soup. Now for the main event! The pork cutlet curry entree is composed of a pork cutlet that has been breaded and fried, then sliced up and topped with Cafe Mami's popular curry sauce. Japanese curry is very different from Indian curry, as it is a mild and particularly savory curry made with a roux base (which is a butter and flour mixture that thickens up the curry sauce) and lots of delicious spices. It is stewed all day with onions, potatoes, carrots, and beef so there are lots of wonderfully infused flavors in the curry. There are optional items to add to the dish, such as a fried egg and/or cheese. 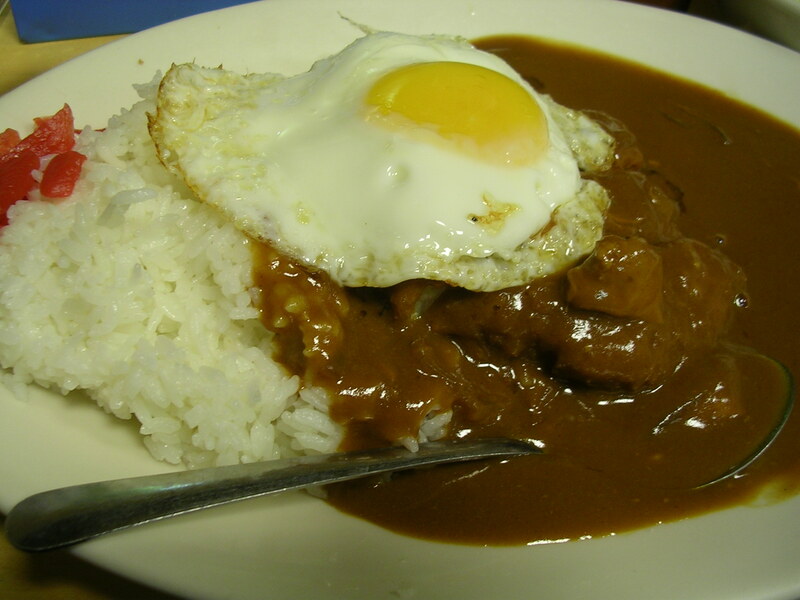 Greg and I both got the pork cutlet curry with a fried egg on top, cooked sunny side up. Yummy! The curry dish comes with a side of white rice that you can get endless refills of, and some pickled daikon radish pieces (the red bits on the left hand side of the plate) that have a sweet and salty flavor with a good bit of crunch to add variety to the dish. I adore Japanese cutlet curry! It is such an amazing blend of flavors and I really like the fact that is it savory (as opposed to the sour taste of Indian curries), which goes particularly well with the pork cutlet. The cutlet is always fried to perfection, and when topped with curry, it really brings out the crunch of the bread crumbs and the pork flavor. Even the curry alone with a side of rice is downright delicious. Mmmm. You get pretty full from the entree, though there are some people that really make the curry last by getting lots of rice refills. I highly recommend this restaurant for all its yummy dishes (I have tried several of them) and its rare authentic Japanese-style comfort food that is so difficult to find in Boston. The only downside would be its price. Our cutlet curry dishes were $9.50 each, which isn't bad in general, but for the awkward seating and our college student wallets it's a bit of a hit. The pho I had earlier this week only cost $5.25 for the bowl. Much cheaper! But to me going to Japantown is always a treat, and the other restaurant stalls also have a lot of amazing and interesting foods to offer. 1 adzuki cream puff from Japonaise! :D I totally didn't realize that Japonaise has a small counter in Japantown where they sell some of the more popular goods from the main store. So of course I was ecstatic and bought 2 adzuki cream puffs to enjoy later on. Sooooo goooooood. 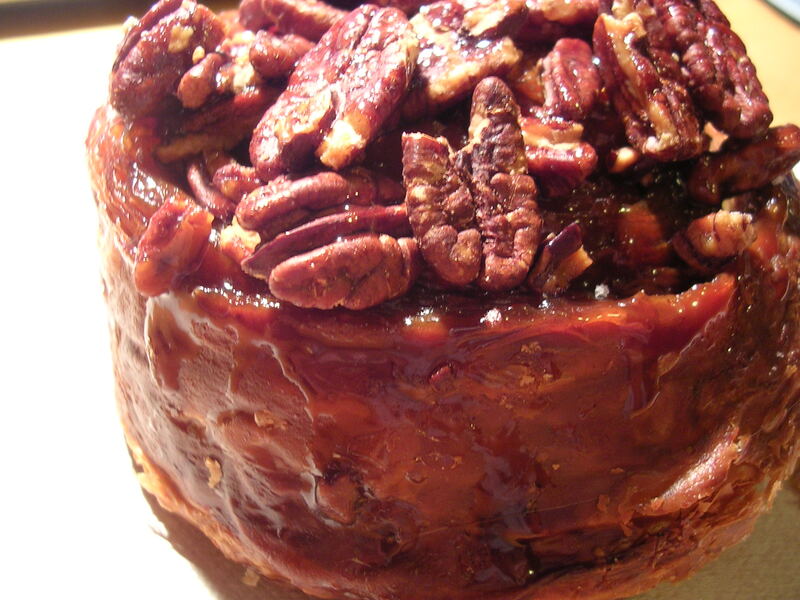 This entry was posted on Saturday, May 19th, 2007 at 7:26 am	and posted in appetizers, desserts, French, Italian, Japanese, restaurant, snacks, soups, Uncategorized. You can follow any responses to this entry through the RSS 2.0 feed. « Thursday, May 17th – Last Day of Classes!! !